An efficient, resilient radiology workflow is crucial to delivering the best patient care. A complex and ever-changing environment - often with resource constraints - requires a considered approach. What are the challenges with medical imaging systems? Medical imaging encompasses many different modalities. X-ray, ultrasound, CT and MRI (among others) all have their own practices and procedures. Image quality and size is increasing from 2D images of several megabytes to 3D images, in gigabyte ranges. Many patients, all with different requirements, need access to diagnostic imaging. A large number of transactions is required to process and fulfil these orders. Unpredictable traffic volume accounts for part of the issue. Hospital departments can be full one moment, and empty the next. Failure to account for surge in demand can cause significant delays. Orders are delivered via a complex network of related but disparate systems. They are often in different physical locations, which presents a significant logistical challenge. What really matters to you, and more importantly, your customers? Medical staff don’t have time to waste. If your systems can’t accommodate moment-to-moment changes in load, things will grind to a halt. The failure of even one system component will have an impact on medical staff. Your customers' priorities are fast response times, low failure rates and the ability to retrieve data from disparate sources. These factors rely on fast, redundant and scalable teleradiology architecture. How do you solve the issues of availability and scalability? Your systems can’t fail when people need them the most. There are no excuses when it comes to people’s lives and wellbeing. Deliver an efficient radiology workflow? Meet the ever-increasing storage demands of today’s medical imaging technologies? Avoid slow and unresponsive services? As demand grows, so must the ability to meet it, reducing delivery times and keeping systems online. Effective load balancing will make things fast and reliable, as demonstrated in the infographic below. Who is responsible for your quality of service? Many healthcare vendors choose to leave load balancing decisions to the customer. How can they be confident it won't break? How do they update systems without downtime? What happens in the event of a failure? Loadbalancer.org appliances guarantee zero downtime and the greatest resource efficiency. From PACS and RIS to EMR and HIS, systems all need the same level of interoperability and performance at scale, whilst maintaining 100% uptime. This ensures that medical staff can spend time helping patients, not waiting for results. Why not sell your solution with high availability built in? We work closely with you and your product team to test, document and validate your turnkey high-availability solution. We also produce comprehensive deployment guides, resulting in smooth deployments and excellent support. Won't get the blame when the customer breaks your product. Don't spend ages helping your customers configure their own network. Can easily perform maintenance and updates without downtime. Get awesome support from our team, who are specifically trained on your product. Use a specific protocol? Whether you use DICOM, XDS, HL7 or something else, we’ll make it work. For example, if you're using DICOM we recommend load balancing in layer 4 DR mode. Layer 4 DR routes inbound traffic around the load balancer and replies are sent directly to the client. By managing the traffic in this way, you can avoid using the load balancer as a forwarder and increase throughput. 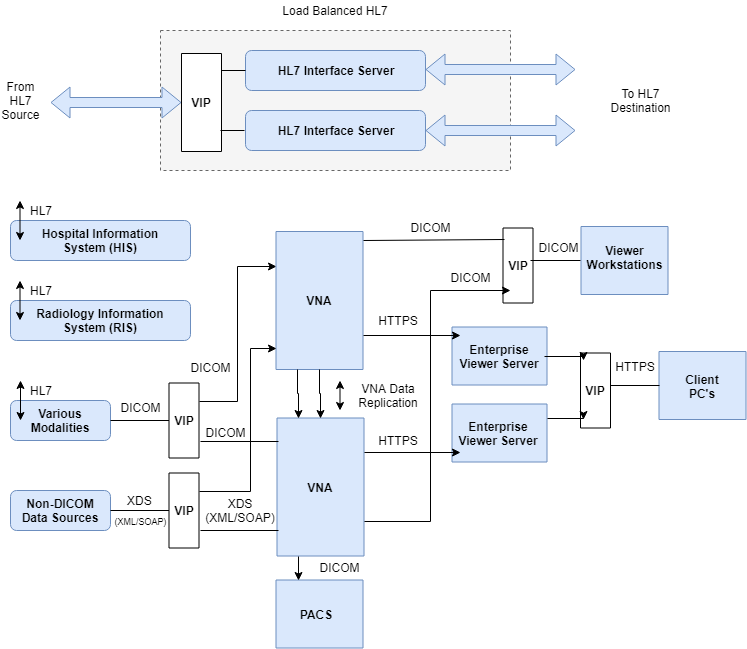 Whereas XDS may use Layer 4, NAT mode and HL7 May require a Layer 7-based approach. No matter what the approach, we always recommend the best fit. If your product requires a specific health check, we’ll include it. For example, we are the only vendor with a native DICOM health check. This means you can deliver a highly capable, hassle-free solution that just works. Do you worry about managing costs? Healthcare budget constraints are often the driver for the quality and standard of care. We’ve talked to vendors who worry about mounting extra costs in an enterprise imaging implementation. Achieving a high level of enhanced capability doesn’t have to be expensive. You can deliver a redundant load balanced solution for less than $10,000. Healthcare providers are balking at the prices of load balancing solutions from industry leaders. With these weighing in at more than 10x the cost of Loadbalancer.org solutions, the choice is simple. Maintenance downtime is another cost factor. By facilitating seamless maintenance, you can mitigate the cost associated with being offline for extended periods. We understand your customers’ needs because we have a proven track record. Hundreds of hospitals and clinics worldwide use Loadbalancer.org to keep their systems running. You can’t trust anyone to ensure healthcare systems unless you know they’ll deliver. Enterprise imaging vendors such as Canon, Siemens, Carestream, Hologic, Ricoh and Agfa all depend on us. We understand your product and the demands of your customers. As experts experienced in this market, we know the challenges you face. We have a collaberative ethos. Our technical architects work with your organization to deliver an approved solution that adds value and cultivates a technology-aligned partnership. We will help design and simplify your architecture, allowing you direct access to our team of engineers via online chat, email or phone. Our approach is tailored: we take the time to understand your products and applications inside-out by setting up test environments. We test, validate and document the deployment to deliver consistency, ensuring zero downtime and effortless maintenance. A fully integrated solution allows you peace of mind. You can be confident of delivering standardized, highly available and painless deployments to your customers - guaranteeing the uptime and performance of your application every single time. If you want a tried and tested solution, and would like to see how our products work, simply download our free trial by clicking here. Don’t forget to access free 24/7 support during your 30-day trial. Short on time? View our online demo here.